Food can be purchased until 11pm tonight. 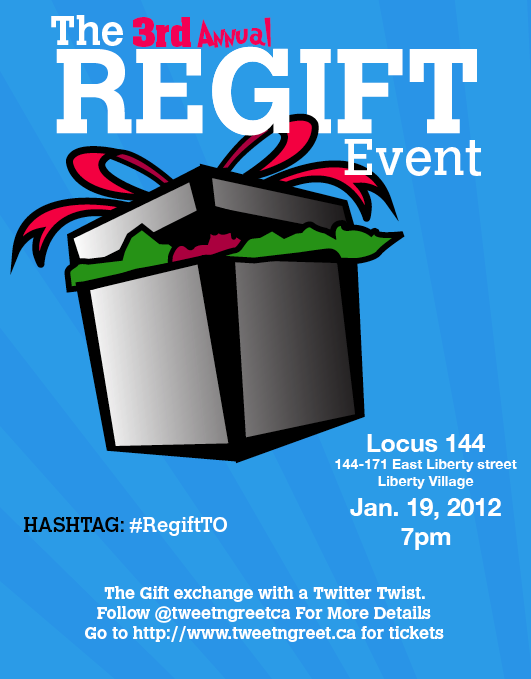 Locus 144 will be the location for the Third Annual Toronto Regift Tweetup. We hope you enjoyed the holiday season and got everything you wanted. But if not – no problem! After the holidays, come ring the new year with us and regift that unwanted present!! Bring a wrapped item to be exchanged with your fellow Twitter friends. More details to come but for now – ENJOY the New Year with your friends and families. See you on Jan. 19 and keep this date clear on your calendars! Ring in the New Year with us and meet some new friends! For more info just follow the hashtag #RegiftTO Announcements & Surprises to come! Register below. Why: Have some fun with Twitter friends. Be Social. What: It’s a gift exchange with Twitter Friends. Bring a wrapped unisex gift minimum value of $10. Bring a gift and open a gift. Don’t like the gift you received? Then continue to exchange with others at the venue. It makes for a social event. Gifts will be opened at 9pm with a countdown. Music and dancing to occur after the gift openings. When: Thursday January 19th at 7pm. Gift Opening promptly at 9pm. 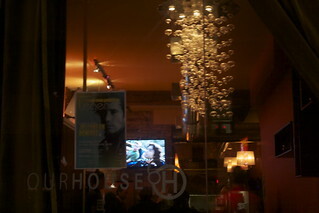 We will have giveaways and prizes so continue to follow #RegiftTO for new details to come. Below are the partners involved with the 3rd Annual RegiftTO event. We would like to welcome Stickeryou, as a partner with the 2nd Annual RegiftTO event this Thursday. Create and purchase your own custom stickers. High-quality, removable, vinyl stickers – the really good ones. Get started with our artwork, or upload your own logo or image – it’s easy. Your stickers will be printed, die-cut, and shipped to your door in about a week. Entripy has partnered with RegiftTO and will be graciously giving a very nice gift to everyone attending the event. I personally have ordered from them and they have a great Twitter presence and a great and simple online order system. We welcome Entripy and thank them for being socially involved with the RegiftTO event. Here is more info on the company. Entripy Custom Clothing (www.entripy.com) is Canada’s leader for custom printed t-shirts and apparel. Entripy Promotional Marketing is a division of Entripy that aims to provide on-time innovative branding solutions and assists with marketing promotions and brand awareness. Entripy provides garment design, screen printing, embroidery and promotional product services from its 16,000+ square foot state-of-the-art facility in Oakville, Ontario. Entripy has an unwavering commitment to superior customer service and a dedication to innovation, research and technology. Entripy provides clients a quality, leading edge product for orders as few as five items to extensive orders numbering in the hundreds of thousands. If you are looking for custom apparel or promotional products, Entripy is the right choice with great quality, service and on-time delivery. Starting today and until January 20th I have a special discount code for $5 off the purchase. Just use the code “regiftTO” to apply your discount. It’s the only gloves that I know that actually work on your touchscreen. Enjoy and see you all at RegiftTO.